The Despoblado Notebook takes its name from the Despoblado Valley (meaning 'depopulated zone') between Copiapo and Chanaral, Atacama Desert, Chile. It is one of the most fascinating of all the notebooks. Darwin used it for the last year and three months of the voyage and it was therefore the notebook that virtually circled the world while in use. Darwin first used the Despoblado Notebook for detailed geological descriptions on the west coast of South America in June 1835, then used it again in the coral islands of the Indian Ocean in the southern winter of 1836. From there he used it in the mountains of South Africa, then on St Helena – one of the world's most remote islands – and then on the east coast of South America. Finally the notebook was used back into the northern hemisphere and the Cape Verdes, which was Darwin's first landfall four and a half years before. Then he had been a young man embarking on a great adventure. Now he was a seasoned geologist whose reputation at the high table of science was already preceding him. The Despoblado Notebook contains the last of Darwin's field notes from Chile but overlaps with the remaining two notebooks for the rest of the voyage. The earliest part of the Despoblado Notebook was used in late June and through July 1835, with scattered notes until the Beagle left mainland South America in September 1835. There is then an eight month gap in use until April or May 1836 when the Despoblado Notebook came back into occasional use for perhaps five months, as summarised below, up to September 1836. Thus the Despoblado Notebook was used by Darwin almost to the end of the voyage and as such it also overlaps with the undated pages of the Santiago Notebook and with the early part of the Red Notebook. In terms of its square shape and red cover, the Despoblado Notebook is almost identical to its two predecessors in the 'expedition number 8' trilogy, all Type 5 notebooks. At about 6,300 words it is, however, significantly shorter than either of them, and has a markedly lower average number of words per page. Conversely, the Despoblado Notebook contains twenty-three sketches, which is the third highest of any notebook and it also has the second highest number (after the Rio Notebook) of excised pages, at fourteen. Curiously Darwin started to fill the Despoblado Notebook from the back for his exploration of the Despoblado valley at Copiapó in June 1835. There are a few entries at the front from 1835, but most of the front dates from 1836. In order to provide a chronological introduction, it is necessary to start by examining the back pages but to keep referring to front pages where they fit chronologically. The first forty-two of the back pages cover the period from 26 June 1835 to the Beagle's departure on 6 July for Iquique, which was then in Peru but is today in Chile. The notebook was not used for the sea passage but records arrival at Iquique on the same page on 12 July, then departure for the port of Callao on 15 July. The next dated page in the Despoblado Notebook is 52b with Darwin in Cape Town on 31 May 1836 and the following twenty pages or so are all from Africa. By p. 74b Darwin was recording his stay on St Helena starting on 8 July, then at Pernambuco [Recife] in Brazil in August on p. 87b, ending on p. 91b, which is the reverse of p. 27a. It is difficult to date the twenty-seven or so front pages, partly because about half of them are excised. They start in Iquique in 1835 then seem to jump to Mauritius in late April-May 1836, St Helena in July, Pernambuco in August and finally the Cape Verdes in September. As such they overlap with the back pages and seem to include the final field notes of the voyage.2 Sadly if there were any notes from Ascension (July) or Bahia (August) they were probably on the excised pages. The first notes are on the inside back cover. Although they clearly relate to Chilean geology they are hard to read and are not easily intelligible. Field notes proper, dated 26 June, begin on p. 1b with 'started from Copiapo valley to Despoblado', followed immediately by a record of a finch, '3 sorts of Caracara' and vicuna. Some of the places mentioned are shown on Darwin's hand-drawn map in DAR 44.28, in colour here. The next day Darwin 'Travelled far up ravine of Paypote [Paipote], came to water, & trees of Algarroba', p. 2b, that is mimosa. There was an 'old man watching old smelting furnace', but Darwin felt 'Too much tired to enjoy these situations'. The notes on these pages are rather hard to understand, like the geology they describe which Darwin calls 'exceedingly complicated' in South America, p. 229. On p. 3b he recorded finding the all important 'Gryphites & Terebratula', allowing correlation by age with the sediments he had seen further south, and on p. 5b he concluded that 'From the quantity of Lava there must have been many volcanoes'. On p. 7b Darwin referred to a diagram he had drawn on the inside back cover of the notebook showing 'some very remarkable forms of stratification' of 'thinly laminated red sandstone' enclosed within porphyritic breccia. This diagram was eventually published in South America p. 231 (below) and seems to be closely related to the one on p. 26b although the latter shows a yoke consisting of breccia rather than sandstone (see below). A small diagram on p. 8b shows what Darwin described as the only case he saw of two 'horizontal Pushes', presumably faults, then there is a larger diagram dramatically showing how the strata on the left have been tipped upside-down on the right. This case of inversion through 135º (i.e. 3 x 45º) is described in South America, pp. 231-2. Diagram showing complex structures in the Despoblado Valley. A mass of sandstone and conglomerate is shown at the centre; it has been severely down-folded into a ‘yolk or urn-formed trough’, with the underlying porphyritic conglomerate strata more or less vertical on both sides of the yolk. On the left these strata are severely faulted while on the right their dip radiates ‘like the spokes of a wheel’. Fig. 24 from South America, p. 231. The rest of the entry for the 27th is unusually reflective, suggesting perhaps that these pages were written once Darwin had set up camp in the evening. The bitterly cold wind which he experienced at night, however, tends to suggest that the entries were written before he broke camp the following morning. Darwin continued the dialogue with himself concerning the extraordinarily complex geological history of the valley, and on p. 11b he asked himself two difficult questions: 'Are the Pampas solely owing to being leeward of currents has the weight prevented subsequent upheavals'. Darwin seems to be asking himself, firstly, whether the vast spreads of porphyritic breccia pebbles and gravels which underlie much of the Pampas but not the west coast are there because the pacific currents swept them away more on that side. His second question is whether the shear weight of the Pampas gravels has prevented the kind of post-eruption upheavals of which there is clear evidence on the west coast ranges. In Birds, p. 117, Darwin's words are printed in only slightly expanded form under the heading Attagis gayii (Rufous-bellied Seedsnipe), but there he noted that the Copiapó 'grouse' takes the place of the ptarmigan of the northern hemisphere. They are, therefore, examples of representative species: ones related and filling similar ecological niches in different places, in this case in opposite hemispheres. That night Darwin had the terrible experience of a 'gale of freezing wind – body benumbed', p. 14b, and he recounted how his Vaqueano had as a boy nearly died in the same mountains. The Vaqueano's fingers had been permanently damaged on that occasion and his brother had frozen to death, along with a large number of mules and cattle. As noted above, the discursive style of these entries suggests that Darwin was comfortable when he wrote them, rather than in the saddle. The geology on the 28th continued to be complex. Darwin found a Terebratula which provided valuable correlation with those from the R. Claro, p. 15b. These occurred 'with Gryphite' which could be among the specimens from Copiapó figured on plate 5 of South America. Darwin's specimen from the 'grand Tufaceous formation' brought the expedition tally to 173. This rock, he had no doubt, was an aqueous deposit, as was in his view 'the whole top of the Cordilleras' giving 'proof of horizontal upheaval to that amount', p. 19b. At the foot of the mountain was a salt lake 'many leagues long' which dried out in summer. The entry for the 29 June is much shorter but includes a full-page sketch apparently showing how the 'Tufa plain was divided by arms of the sea', pp. 20b-21b. Darwin also stated his belief that 'the Carrancha & Chimango are found [there] Certainly the former'. By p. 26b Darwin had firmed up his opinion on this point: 'NB. Have not seen the Chimango since leaving Coquimbo'. On 2-3 July Darwin 'Staid in Copiapo', p. 35b; according to the Beagle diary this was with Mr Bingley. On the 4th Darwin 'Set out for the Port', p. 36b, and observed that the soil was unproductive due to its high salt content. The reference on p. 38b to an analogy with 'Apothecary Hull' is obscure. Darwin reached the port of Caldera on the 5th and found the Beagle arrived on the 3rd, but with Wickham in command, temporarily covering for FitzRoy. That evening Darwin bade farewell to Mariano Gonzales, his trusty guide over many leagues. Gonzales, unlike Syms Covington, was later referred to by name in Journal of researches. On the 6th Darwin 'Examined cliffs near the Port' where he found masses of shells and 'some large bones'. There were various rocks including 'enormous blocks of granite', p. 41b. On these pages Darwin retrospectively inserted geological specimen numbers 2846-9. No doubt he was relieved at last not to have to carry his specimens too far from the Beagle. They sailed north at midday, leaving Chile for the last time and arriving at Iquique, Peru on the evening of 12 July. Darwin may have spent the week at sea sorting out his specimens and writing up his notes. The Beagle stayed at Iquique for three days, but Peru was in political turmoil and Darwin could not do much apart from a two-day visit to a saltpetre works. On p. 44b he noted various pieces of intelligence, including an unspecified person's opinion that 'Absence of Volcanos in Copiapo & Guasco account for frequent Earthquakes'. There are some entries at the front of the notebook which refer to Iquique: on p. 2a Darwin mentioned the 'revolution', the high price of water and the fact that firewood had to be imported. He also referred to the two small mining villages of S. Rosa and Guantajaya which he saw on his way to the saltpetre works (Beagle diary for 13 July). The Beagle sailed north again on the evening of 14 July 1835. This is perhaps the only case of the same date in for two different years occurring in the same notebook, as there is an entry for 14 July 1836 on p. 85b. The next date recorded in the notebook is 19 July 1835 'at night outside of Callao', the port of Lima. The passage had been short and steady, owing to the south-easterly trade winds which would carry the little ship up to the Galápagos in September. Darwin recorded on 20 July that they 'Swept in miserable Callao – Soldiers – green country', p. 44b. He was not impressed, but the next day he went for a walk on the Island of San Lorenzo. His cryptic notebook descriptions 'cold – Drizzle = Callao – flat roofs – Heaps of corn – fruits – splendid castle' are greatly expanded in the Beagle diary in entries that were obviously written up weeks later. Around this time Darwin put the Despoblado Notebook aside and entered his field notes for Lima in the Galapagos Notebook. There is a mention of the churning of sediment on the beach at Callao in an entry made on 14 July 1836 on p. 86b. This links to two references to Callao in the Red Notebook, the first referring to the erosion of the cliffs on San Lorenzo, p. 40b, and the second being the 'most manifest example of degradation I ever saw on beach near Callao', p. 95. These entries were, therefore, probably made about a year after Darwin's sojourn in Peru. On p. 46b Darwin made a few notes about earthquakes and tsunamis, then on the next page started to record corals and other material apparently taken during depth soundings, which was a major interest to him, as discussed in the introduction to the Santiago Notebook. There is no location or date specified for these entries which extend for five pages until Madagascar is mentioned on p. 52b. However it seems likely that they were made in the Indian Ocean for the reasons given below. It is possible that the notes were made in the Pacific after leaving the Galápagos as the Beagle began to pass coral atolls in the Low Archipelago around 13 November 1835 on her way to Tahiti, but if that were the case Darwin might have been expected to have used the Galapagos Notebook. The coral notes could also date from after Tahiti, that is late November or early December 1835, but it is doubtful if there were many opportunities for soundings at coral islands in the Pacific after Tahiti. The only place from which Darwin recorded soundings having been made was Whytootacke [Aitutaki] in the Cook Islands on 3 December (Coral Reefs, pp. 154-5). Immediately following the coral entries, on p. 52b, Darwin wrote 'Madagascar – African coast ships' recording his first glimpse of the African continent. We know from Covington's Journal that this sighting was on 13 May 1836 (Young 1995). Thus the coral entries seem likely to date from the Indian Ocean, which implies that they were made at Keeling between 1-12 April 1836, as Armstrong 1991 thought, or at Mauritius between 29 April and 9 May. The soundings from which this section is laid down were taken with great care by Capt. FitzRoy himself: he used a bell-shaped lead, having a diameter of four inches, and the armings each time were cut off and brought on board for me to examine. This footnote exactly matches p. 51b in which Darwin twice states the diameter of the lead as 4 inches. It should be noted, however, that Darwin reported in Coral Reefs that all the soundings deeper than 20 fathoms indicated a sandy bottom at Keeling, or in other words that there was no more living coral below 20 fathoms. The notebook account, on the other hand, records on p. 49b at 30 fathoms 'coral probably living'. But he may have later revised this conclusion. Darwin also referred to the same sounding lead being used at Mauritius (Coral reefs, pp. 80-82) and the species encountered at different depths there is a strong correlation between the notebook lists and the published account for Mauritius. One particularly telling note is on p. 48b where Darwin recorded at 15 fathoms 'splendid Astrea' which must surely be the antecedent for his published statement that off Mauritius for 'twice at the depth of 15 fathoms, the arming was marked with a clean impression of an Astraea' (Coral reefs, p. 81). Whilst this is not conclusive on its own, when considered with the circumstantial evidence, this permits an identification of the entries as relating to Mauritius rather than to Keeling. It is also possible that Darwin was making his sounding notes on Mauritius within days of his expressing his fascination with coral reefs to his sister Caroline in his letter dated 29 April 1836 (Correspondence, vol. 1, p. 494). Two of the mountains on Mauritius which Darwin climbed, La Puce and (if the identification of 'P.B.' is correct) Peter Botts, are mentioned on the stubs of pp. 6a-7a. Since Darwin's other observations on the Island are in the Sydney Notebook, there seems to be no notebook coverage for Keeling. Intriguingly, this might be linked to the lack of any extant notebooks for Hobart or King George's Sound, whereas there are field notes of various descriptions preserved at Cambridge University Library for all three of these consecutive locations from January to mid April 1836 (Armstrong 1985, Armstrong 1991; Banks and Leaman 1999). There is an entry on p. 9a which is certainly a description of an invertebrate animal, but it is too telegraphic to permit precise identification. The '8 or 12 perhaps in a circle' after mention of orifices seems suggestive of a coral and it may well be the 'Meandrina' described in the Zoology notes, p. 306 (specimen no. 3605 under the general heading of Keeling). Although it is out of date sequence, this might be explained by Darwin finding and preserving the specimen at Keeling but not examining it until after Mauritius. The next entry marks the sighting around 13 May of Madagascar on p. 52b and arrival in Simon's Town, Cape of Good Hope, on the 31 May 1836. See Armstrong 1991 for a superb account of Darwin’s three weeks at the Cape, based partly on the entries in the Despoblado Notebook. Darwin's first note was probably made afloat in the Bay: '2 or 300 white houses scattered along beach backed by barren wall of rocks'. In the Red Notebook he reminded himself to check if the depth had been '70 fathoms 20 miles from the shore?' (Red Notebook, p. 15e). The next entry is 'Wednesday morning' (i.e. 1 June) but actually records Darwin's trip by gig to Cape Town in the afternoon. The Beagle diary account expands on the trees and scenery, but lacks the delightful notebook simile of the white Wijnberg [Wynberg] houses 'as from a town dropped in country'. Darwin 'arrived after dark', p. 53b, and he had difficulty finding quarters because most beds were taken by passengers from some ships which had arrived that day from India. On the 2 June he 'wandered & rode about town' and was impressed by the extraordinary bullock wagons and by the 'really very splendid wall of the well known table mountain'. Darwin then commenced his geological account of the Cape which was eventually included in Volcanic islands. On notebook pp. 54b-55b he recorded briefly the slates and sandstones of 'Lions hill'. On Saturday 4 June he 'started on a short ride of four days first to the Praal', p. 55b. Praal is about 60km northeast of Cape Town and Darwin arrived that evening with time to ascend the granite hills behind the town which, as he wrote in the Beagle diary, reminded him of northern Chile. En route, however, the houses and flowers reminded him of eastern South America and a ferruginous sandstone reminded him of King George's Sound in Australia, pp. 55b, 57b. Darwin's observations on King George's Sound are analysed in great detail in Armstrong 1985. The next day Darwin went 'across pass of French Hoeck [Franschhoek]', a 'considerable work', where the Dutch were hospitable, 'but [did] not like the English', p. 58b. Darwin likened the country to Wales and noted 'Emancipation not popular to any people, yet will answer'. To judge from a series of sketches, he was intrigued by the bare white sandstone, by lines of faults dipping en echelon south-eastwards and by 'very remarkable stratification'. He arrived at the toll bar at one o'clock in the afternoon and took lodgings at 'Comfortable Mr Holms house'. On 7 June there was a 'hot wind, gale from N[orth]'. Darwin described the sandstones sitting above granite, with slates at the Lions Rump which he compared to those he had seen previously at Lions Hill, p. 65b. He described how the slate 'becomes compact & homogenous' as it approaches the granite 'then in parts white spots appear Feldspathic which be [sic] weathering makes rock cellular, then granular & black micaceous fine grained mica in spots'. This description appeared in clearer form in a footnote to Volcanic islands, pp. 148-9. On p. 68b Darwin noted 'Dr Smyth – Karroo Clay Slate' with a small sketch and on the next few pages refers to Dr Andrew Smith who showed Darwin a series of exposures of the granite/slate junction. These revealed features such as 'ghosts' of the slate within the granite which convinced Darwin that the granite had been injected in a liquid state, a view not universally accepted at the time. He also traced the transition from slate into gneiss at the Lions Rump and decided that the foliation of the gneiss was of metamorphic origin and did not necessarily indicate the original sedimentary layering. Darwin declared this view forcefully in South America, p. 165, and specifically mentioned Sedgwick and Lyell as geologists from whom he differed on this point. Darwin's analysis of the junction between the deeply weathered slates and the granite at this important site is discussed with reference to his specimens in Herbert 2005, pp. 126-8. The dates 8-10 June barely figure in the notebook, presumably because Darwin was 'not very well' on the 9th (p. 72b), although we do know that Darwin visited Sir Thomas Maclear, the Astronomer Royal, on 10 June (Crompton and Singer 1958). There is no record of the 11th but on the 12th there is the entry 'Museum long walk' and on the 13th 'evening Colonel Bell'. This last event was significant because Darwin cited it in his Autobiography, p. 107, where he recalled dining with 'Lady Caroline Bell' who, while being a great admirer of Sir John Herschel, the astronomer at that time residing at the Cape, commented on some of his slightly odd behaviour. It seems likely that Darwin was muddled about the Lady's name, as according to the DNB Sir John Bell's (1782-1876) wife was of Russian extraction and rather than being Caroline had been named after Catherine the Great. The 14th warrants no entry but on the 15th Darwin noted his visit to Sir John Herschel whose clear exposition of the methods of scientific investigation had so influenced Darwin while he was at Cambridge. It is well known that Herschel's philosophy of science was of profound importance to the way Darwin developed his theoretical positions, firstly his coral reef theory but most importantly his theory of evolution by natural selection. It was also Herschel who coined the phrase 'mystery of mysteries', in a letter from the Cape to Lyell dated 20 February 1836 (see Wilson 1972, pp. 438-9), for the origin of new species, a phrase Darwin used in the opening paragraph of Origin. In the Beagle diary Darwin stated that his encounter with Sir John 'was the most memorable event which, for a long period, I have had the good fortune to enjoy.' The notebook entry seems to be the only known Darwin manuscript record of the precise date of this event. It is clear from Darwin's letter to Henslow of 9 July (Correspondence , vol. 1, p. 500) that in addition to dining with Sir John he also 'saw him a few times besides'. On 16 June Darwin 'Returned to ship' and on the 17th went for a 'Walk with Sulivan', p. 73b. On the 18th they 'Sailed – Evening' and commenced the long passage across to England, bound initially for St Helena. It would be remiss not to mention at this point, however, the longer term value to Darwin of his stay at the Cape. His lengthy discussions with Andrew Smith, continued back in England, concerning the large mammals of Africa were of great importance in convincing Darwin that sparse vegetation was not the explanation for the extinction of the large South American mammals he had discovered. Darwin discussed this at length in his Journal of researches (see Thackeray 1982-3 and introduction to the St. Fe Notebook). The notebook is silent for ten days but records crossing the Tropic of Capricorn on 29 June and arrival on St Helena on 8 July, p. 74b. At some point a few days after crossing the Tropic the Beagle would also have crossed the Greenwich meridian and would effectively have circumnavigated the globe. From that time onwards Darwin and his shipmates may have had their thoughts firmly set on returning to England. It was to be 'a sore discomfiture' for Darwin when he realised on 23 July that the ship, instead of continuing north from Ascension, would make a major detour back to South America. On p. 74b Darwin described the general aspect of the rock fortress of St Helena and noted how the 'small town' of James Town on the volcanic island's northwest side stretched up the 'little flat valley' behind. He 'Walked up ladder hill - curious' then 'to High Knoll castle or Telegraph' which reminded him of an 'old Welsh castle'. Darwin was obviously impressed by the scenery, with 'deep valleys or naked pinnacles' and the 'little white houses placed in most marvellous position', p. 75b. At this point we need to consider the notes on St Helena Darwin made in the front of the notebook. These are on pp. 10a-14a and although secondary to the notes on the back pages they are interesting in referring to compass bearings of landscape features. Sadly the following eight pages are excised. These may well have included field notes from Ascension. Darwin also made some notes about St Helena in the Sydney Notebook (pp. 59a-62a) but because those are followed by entries relating to Mauritius they presumably derive from something Darwin was reading about St Helena. Darwin's Sydney Notebook notes are geological and in particular they refer to subfossil Bulimus land snails and the bones and eggs of albatrosses. It seems most likely that the book Darwin was reading when he wrote those notes was Robert Seale's Geognosy of the Island of St Helena (Seale 1834) as Darwin cites Seale's book in reference to finds of albatross bones in his Volcanic islands, p. 90. It is also very likely that the two men met and discussed these topics, perhaps in England, as Darwin says that Seale 'gave me a large collection' of the snails (Volcanic islands, p. 89). Darwin was very interested in the destruction of the Island's native trees and land-snails by pigs and goats introduced in 1502 and he discussed this subject in Natural selection, p. 192. Darwin's Despoblado Notebook notes from St Helena complement his exceptionally disjointed Beagle diary account which suffers from having lost two pages of insertions, and from a too obviously inserted paragraph on the destruction wrought by species introduced to the Island. The notes also complement Darwin's published description in Journal of researches, in which he refers to St Helena as 'this little world within itself', and his highly detailed chapter devoted to St Helena in Volcanic islands. Chancellor 1990 summarised Darwin's manuscripts relating to St Helena and craters of elevation, a theory Darwin was working on at almost exactly the same time as he was distilling the essentials of his theory of natural selection, in September 1838. Darwin was always proud of his geological work on St Helena. In his Autobiography Darwin singled out out his elucidation of the structure of 'certain islands, for instance, St Helena' as among the scientific results of the Beagle voyage which gave him 'high satisfaction'. Hearl 1990 gives an excellent short account of Darwin's stay on the Island which is a useful supplement to Quentin Keynes's more general account (reprinted 2005) and that of Armstrong 2004. Hearl was able to track down the sad fate of Robert Seale's 'gigantic model' of the Island which was of considerable interest to Darwin (Chancellor 1990). Hearl informed us (personal communication) before he died that the model, which must have been c 2m across, went from Addiscombe College to the Royal Artillery Museum at the Rotunda in Greenwich (now closed). According to Gosse 1938 the model was broken up around 1930. We are grateful to Paul Evans of the Royal Artillery Library, Woolwich, for checking the Rotunda catalogues and for confirming that the model was there from 1862 to 1930. Sadly all the other records were destroyed by fire bombs in 1940. On 9 July Darwin 'Obtained Lodgings in country in centre of Isd near stones throw of Nap[oleon']s grave', p. 75b. At some point during the day he wrote his last voyage letter to Henslow, in which he asked the older man to propose him for Fellowship of the Geological Society (see Correspondence vol. 1, p. 500). In this letter he also referred to St Helena as 'this little centre of a distinct creation', a phrase which became 'a centre of distinct creation' in his geological diary (DAR38.920). At this stage in the voyage Darwin was acutely interested in island biogeography. He had no doubt been anxious to test Lyell's speculations in the second volume of the Principles that St Helena would have acted as 'focus of creative force' and it was at almost exactly this time that Darwin wrote the famous 'Ornithological notes' passage about the relationship between oceanic islands and 'the stability of species' (see introduction to the Galapagos Notebook). On seeing how close Napoleon's grave was to the road Darwin was struck by all the 'bombast & nonsense' he had heard about it, which he dismissed as 'sublime & ridiculous', pp. 75b-76b. Keynes 1979, p. 359, reproduces Sym's Covington's sketch of the tomb. The next day 'Things improved' and Darwin 'hired guide 55 years old – feet like iron – mulatto'. Together they 'Walked to Flagstaff [Hill] along race course' and 'Passed long wood', the house in which Napoleon 'really lived & died very poor'. Darwin was appalled by the 'Walls scored with names of Seamen & Merchant captains'. He felt that 'It appeared degradation, like profaning old cattle', p. 77b. On 11 July Darwin 'Walked Bencoulen Plain down to Prosperous Bay' on the Island's northeast coast. He thought it absurd that there were so many guard houses and forts, now that 'Prosperous' was no longer an appropriate epithet. The references on pp. 78b, 83b to flocks of terns 120 miles out at sea are clearly later insertions, as we know from the expansion of these references in the 'Ornithological notes', p. 76 verso, that Darwin saw these terns off Bahia sometime in the first week of August. On p. 78b he drew a delightful 'pin' drawing of a man (presumably himself) struggling to stand on the windy edge of the cliff. Darwin remarked in the Beagle diary that the cliff was about 300m high. Barlow 1945, p. 255, states that her father (Darwin's son Horace) demonstrated this wind effect to her as a child, suggesting that Darwin had shown his own children what had happened to him on St Helena. Strangely there is no entry for 12 July but on the next day Darwin visited 'Lott & Lotts Wife' on the south side of the Island. These are both odd-shaped pinnacles of phonolite which Darwin described in Volcanic islands, p. 85. It is clear from the notebook entry that Darwin could see that they were the upstanding remnants of an east-north-east trending dyke which he could trace as far as 'Man of War Birds Roost', p. 79b. His notes show that he was trying to understand the geological structure of the Island. Was it a group of volcanoes, or one big volcano? His mature view, sketched out in Journal of researches and later detailed in Volcanic islands, was that it was an example, comparable to Mauritius and St Jago (Cape Verdes), of an elevated volcanic island where the outer rim was being uplifted more than the centre. St Helena, Darwin thought, is the northern part of a great crater, the southern half having been 'removed by the waves of the sea' (Journal of researches, p. 581). On p. 81b Darwin drew a section through a trap dyke truncated by erosion at the top, then covered by more recent rock, thus demonstrating the long intervals of time between eruptions, which he thought were 'probably terrestrial'. This sketch was worked up via a version in DAR38.931 and eventually published as woodcut no. 10 of Volcanic islands, p. 82 and below). ‘Dike.’ from St Helena. Fig. 10 from Volcanic islands, p. 82. On p. 83b he drew another sketch linked to notes about the 'effect of prolonged elevation' on the evolution of cliffs, a subject he developed in the Red Notebook and in Notebook A (see Chancellor 1990). He also drew a sketch showing how dykes seem to 'stretch' a volcano, a theme he discussed with reference to St Helena in the Red Notebook (e.g. p. 59). The diagram was published via a draft version in DAR38.929 as woodcut no. 8 in Darwin's discussion of the role of dykes in volcanic districts in Volcanic islands, p. 76 and below. "The double lines represent the basaltic strata; the single, the basal submarine strata; the dotted, the upper feldspathic strata; the dikes are shaded transversely." Crater on St Helena. Fig. 8 from Volcanic islands, p. 76. Darwin made two comparisons between what he saw on St Helena with what he had seen earlier in the Galapagos. On p. 85b he drew what might be a sketch of Lott's Wife 'like at Galapagos' and on p. 86b he seems to indicate that at both places sand may be derived from shells which over time lost all visible trace of their structure. He then simply noted 'Sailed 14th', that being the date the Beagle left St Helena, followed by some jottings on crops he had seen at Sir William Doveton's house, perhaps indicating the source of Darwin's interest in the introduced plants of St Helena. He also noted that English game laws applied because there were so many introduced game birds; p. 86b ends with mention of the beach at Callao. The Beagle continued north-westwards to Ascension where she arrived on 19 July 1836, but this was a Tuesday so the next note 'Arrived Friday', p. 87b, must refer to arrival at Pernambuco on 12 August, as does the next extant note in the front of the notebook on p. 23a. The Beagle had been at Ascension until 23 July, had turned south-south-westwards to Bahia on the Brazilian coast, arriving on 1 August and had then set off for Pernambuco on the 6th. There are, therefore, no field notes in the Despoblado Notebook from Ascension or Bahia (the latter are on loose sheets in DAR38.954-5). The passage to Pernambuco had been unpleasant 'heavy rains, winds easterly', p. 87b, and Darwin was disenchanted by the 'filthy narrow streets' and the 'filthy old Hags of Nuns'. According to the Beagle diary, however, he enjoyed his canoe trip to 'old Olinda'. On p. 88b Darwin referred to Lyell's Principles 'Vol. I P. 314 Refers to Hoff about T del Fuego & Patagonia', this being a cross reference to vol. 2, p. 476 of the massive compilation of geological facts in von Hoff 1822-4. Lyell was intended to define the southern limits of the Andes, and numbered von Hoff among those who conceived the Andes 'to extend into Tierra del Fuego and Patagonia'. It is by no means obvious why Darwin made this reference at this point in the notebook. The bright green colour of these [mangrove] bushes always reminds me of the rank grass in a Church-yard: both are nourished by putrid exhalations; the one speaks of death past, the other, too often, of death to come. On p. 23a Darwin recorded the various types of organisms at different depths 'Off Pernambuco'. He summarised this information in the Beagle diary, noting that the sandy bar through which ships had to pass did not support true corals. His description of the bar was published separately (Darwin 1841) and reprinted in the second edition of Coral Reefs 1874, p. 265. The Beagle left Brazil on 17 August and crossed the equator on the 21st. The next note in the Despoblado Notebook is 'arrived on 31st', p. 24a, which must refer to the Beagle's landfall at the Cape Verdes on 31 August 1836. Darwin noted 'No kingfishers at present. Sparrow building – land rather greener' as a result of recent rain, in contrast to the arid conditions on his first visit to the archipelago in January 1832. Darwin finally noted some bearings and distances. He left St Jago on 4 September, heading for the Azores, arriving on the 19th and leaving on the 23rd. His next stop was England. 1 In keeping with a policy using place names Darwin used, we refer to the Cocos (Keeling) Islands as the Keeling Islands, although they are today almost always called the Cocos Islands. We refer to Mauritius by that name even though Darwin sometimes called it Isle de France, for example on the cover of the Despoblado Notebook. 2 The September Cape Verde notes are the last field notes, but there are some jottings from the Beagle's departure from the Azores on the inside front cover of the Red Notebook, which in our view read as follows: 'Sailed 24th [September 1836] [Friday, gale 29th deleted] Friday Thursday 29th gale'. That there was a storm on the 29th is confirmed by the meteorological log in the Appendix to FitzRoy's Narrative). 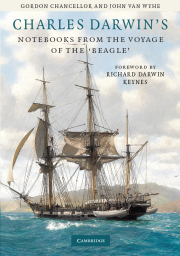 Darwin disembarked from the Beagle for the last time, in Falmouth, on 2 or 3 October 1836.